전남과학대학교 출장명령서 시스템입니다. ---- 개발자 연락처 : +82618827771 JeonnamScienceUniversity trip order system. 1. 모임의 회비를 관리합니다.2. 나만의 일정표를 만들어 보세요. (모임의 공지 및 회원들의 생일 정보가 자동으로입력됩니다.)3. 비공개 모임을 통해 우리만의 이야기방을 만들어 보세요.4. 통합 관리를 통해 내 모임들의 회비 내역을확인하세요.5. 웹 기반 프로그램으로 웹에서도 이용이 가능합니다.6. iOS는 개발중에 있으며 웹으로 이용이가능합니다.모임 이야기는 모임만의 이야기를 만들어 나갈 수 있도록 제작되었습니다.여러분의 의견은 앞으로 지속적인업데이트에 반영됩니다.점점 성장할 수 있는 프로그램이 될 수 있도록 많은 의견 부탁드립니다.1. manage themembership of the group.2. Create your ownitinerary. (Birthday announcements andinformation of members of the group will be enteredautomatically.)3. Create our own story room with a privatemeeting.4. Check the details of your membership meetings throughintegrated management.5. You can use a Web-based program in theweb.6. iOS is under development is available on the Web.Meeting thestory is designed so that you can continue to make a story, onlythe meeting.Your opinion will be reflected on future ongoingupdates.To be a program that can grow more and ask a lot ofopinions. 남부대학교 전자출결용(학생/교수) 프로그램입니다. 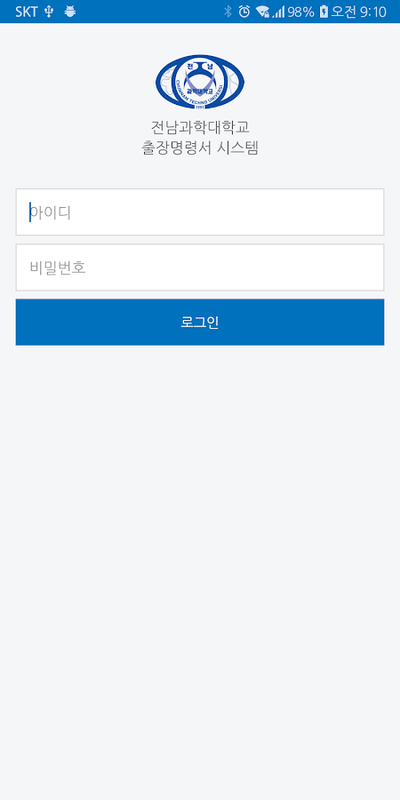 ---- 개발자 연락처 : +82618827771 SouthernUniversity (student / professor) for electronic attendance program.